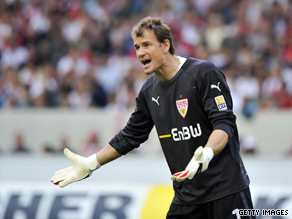 (CNN) -- Goalkeeper Jens Lehmann has been dropped from Stuttgart's first-team after he paid an unauthorized visit to the Oktoberfest just hours after his side's defeat to Cologne. Goalkeeper Jens Lehmann has been dropped from Stuttgart's first-team after he paid an unauthorized visit to the Oktoberfest. The 39-year-old former Germany international was spotted at Munich's beer festival following Stuttgart's 2-0 home defeat to Cologne in the Bundesliga and did not have permission to attend. Lehmann made an error to gift Cologne their second goal of the match when he raced out of his area only to lose possession and allow Wilfried Sanou to shoot into an empty net from 45 yards out. Marcus Babbel confirmed the decision to axe him from the side and told the Stuttgart Web site: "Director of sport Horst Heldt and I will talk with Jens about this on Thursday and then we will see where to go." Lehmann apologized for breaking club rules, accepted the suspension and claimed his motives were in a good cause. "The visit to the Wiesn (Oktoberfest) was part of a charity event and it had been planned for a long time," he explained. "However, it was not agreed with the club. Of course I accept the measures taken by the sporting management." Meanwhile Hamburg midfielder Ze Roberto has urged his teammates to set their sights on winning the Bundesliga title this season. The Brazilian, who won the league with Bayern Munich, has played a key role in the unbeaten start to the season which has left Bruno Labbadia's side at the top of the table. He said: "Hamburg must think big for the future. A team like Bayern Munich want to win the Bundesliga title every season. That should be our target as well. "I want to win the league title this year already. I feel like we have a good chance to win the Bundesliga if we continue like this."